You have probably walked past this place on more than one occasion. In all honesty, there is not much in the way of signs or a nice exterior to attract you inside. We will invariably get a plate of braised food, too. 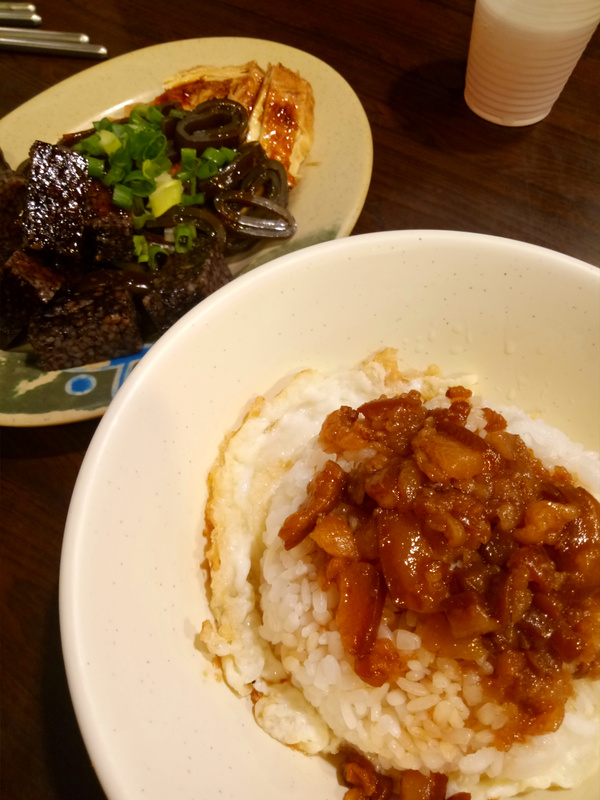 In this case it was seaweed (海帶), pig blood cake (米血糕 is black pudding, essentially), and tofu skin (豆皮). If we go back here, I probably won’t get this again. It isn’t that I am against the flavour, it is just that the bowl of rice is so filling that finishing this plate is a bit of an effort. OK, so it didn’t look this messy when it arrived. It just looked like the other bowl above. But, there’s a method to this bowls madness (and disgusting appearance upon stirring #uglydelicious anyone?). Not only do you have the same stewed belly pork gravy ladled over the rice with a fried egg here, but you also have thin slices of belly pork with garlic sauce sprinkled in there for good measure, too. Now, this place isn’t going to win any beauty pageants or prizes for delicate flavours. But, it isn’t going to disappoint you if you want some rustic Taiwanese grandma-style food on a cold winters night.